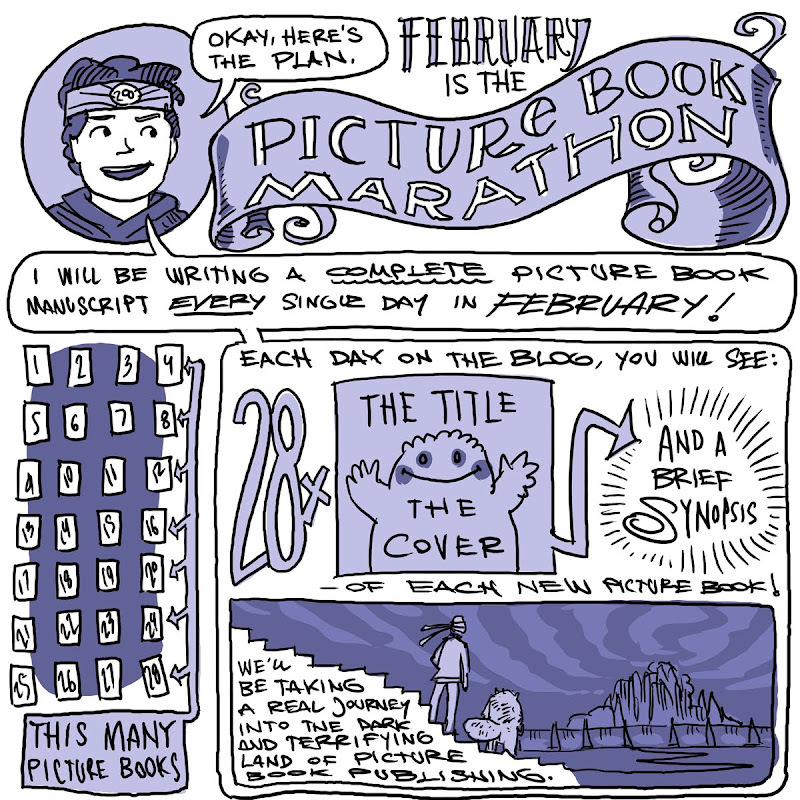 That's right gang, I'm going to write a book a day in February! I won't be posting the full manuscripts, but I will be posting the title, cover sketch and synopsis for each book. 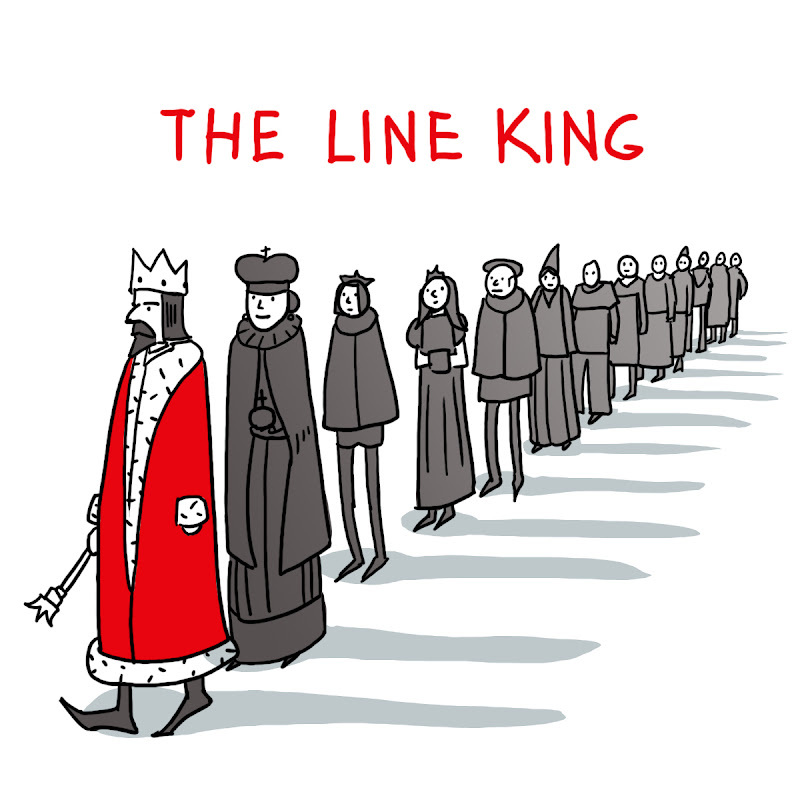 So it's like NaNoWriMo times TWENTY EIGHT! 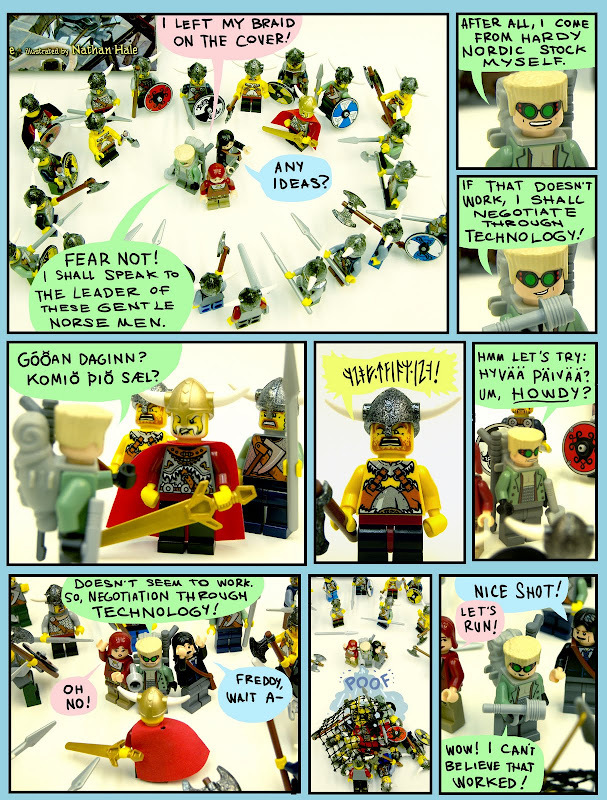 This isn't my idea, there is a company, like NaNoWriMo, hosting this crazy event. In fact, if you want to play along at home, you can join here, it's free--today's the final day to join! They have some handy tracking tools, as well as support for picture book writers. I have no clue how this will turn out. I may have HORRIBLE ideas some days (maybe most days) but I'm confident that something will turn up, you write 28 picture books, at least one should have potential, right? 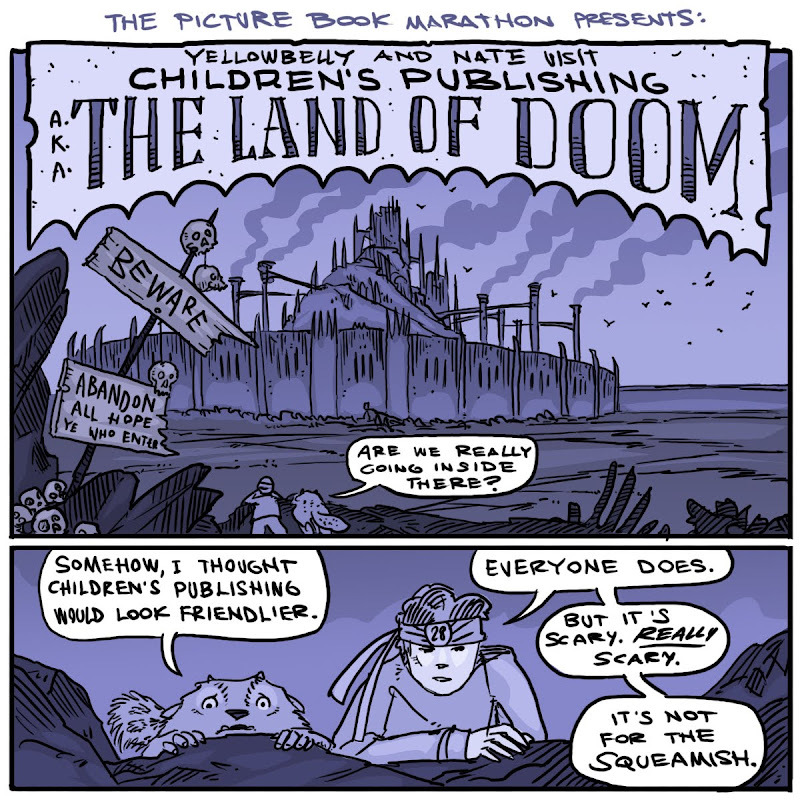 To give the marathon a narrative thread, Yellowbelly and I will be going on an epic quest, into the nightmare landscape of picture book publishing itself. February is going to be pretty heavy duty. Better rest up. 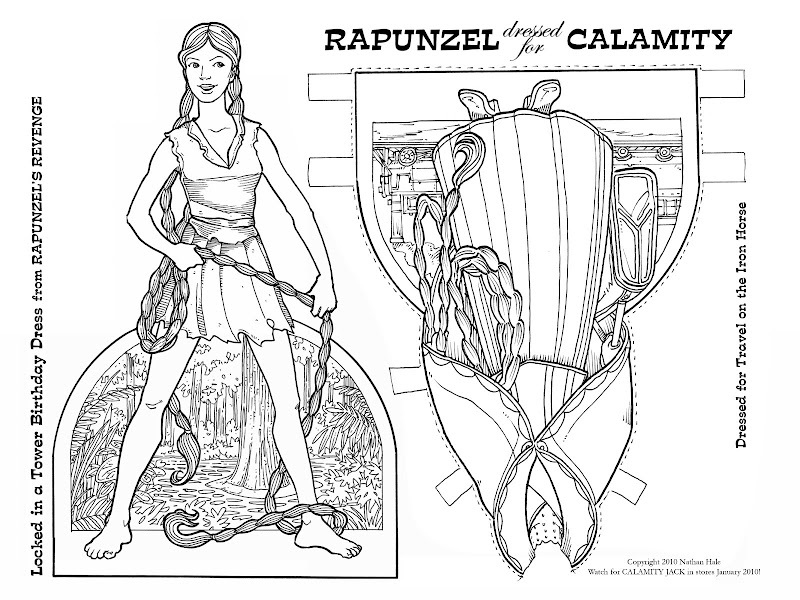 Let me correct Rapunzel, I know she called it a "Tractor," and it's obviously a "Combine Harvester." But she's from the past, she doesn't understand the finer points of modern farming machinery. I think I have everyone's avatar/cartoon photo now--make sure to send yours in if you haven't yet (and you qualify.) I'm going to try and get them all drawn this week. 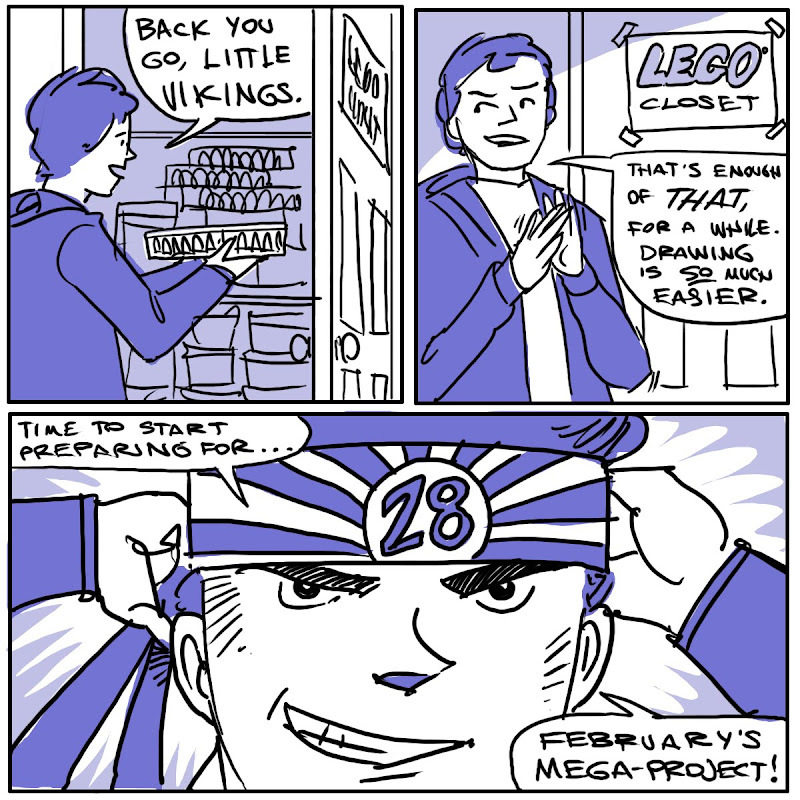 Just for kicks, there will be one more LEGO post tomorrow. Oh boy, now you've done it. 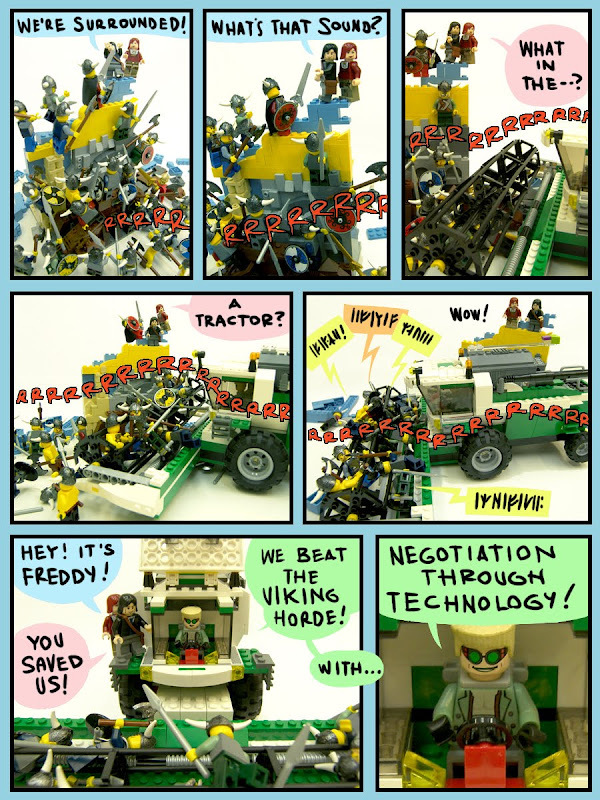 You seemed to enjoy the LEGO post...so it is continuing. Since Monday was a holiday, and last week was Deadline-a-palooza. I thought I'd take it easy for a bit and get out the LEGO. 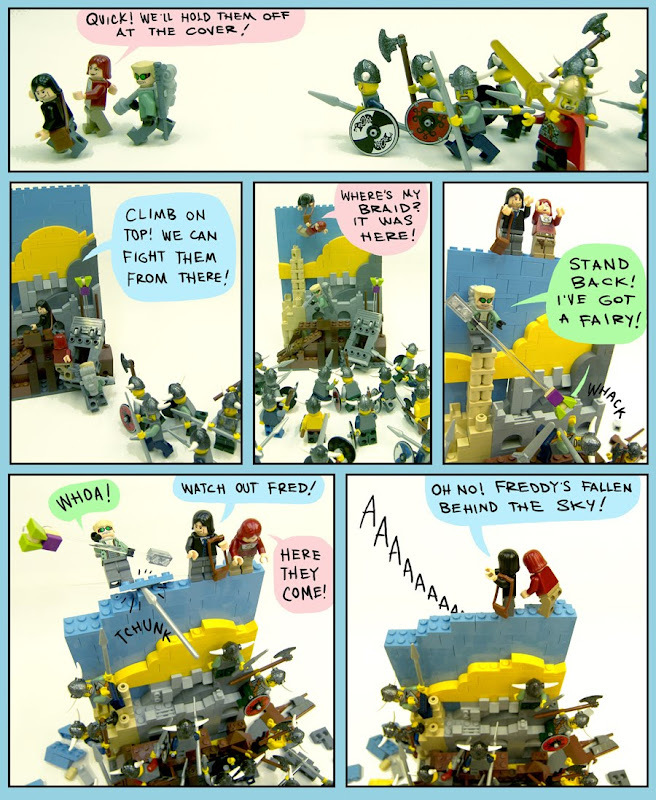 You remember LEGO Yellowbelly, and LEGO Rapunzel, well, here's LEGO Calamity Jack. That sky uses just about all the light blue bricks I have--light blue's hard to come by. 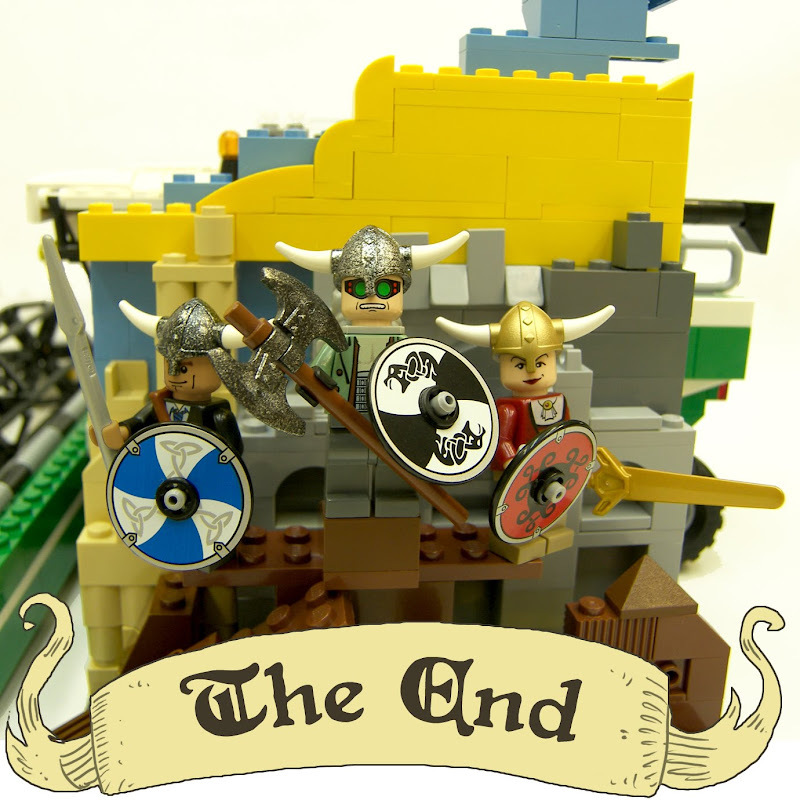 The challenge with LEGO is using only existing pieces, no painting or customizing is allowed, you have to use legitimate factory pieces. 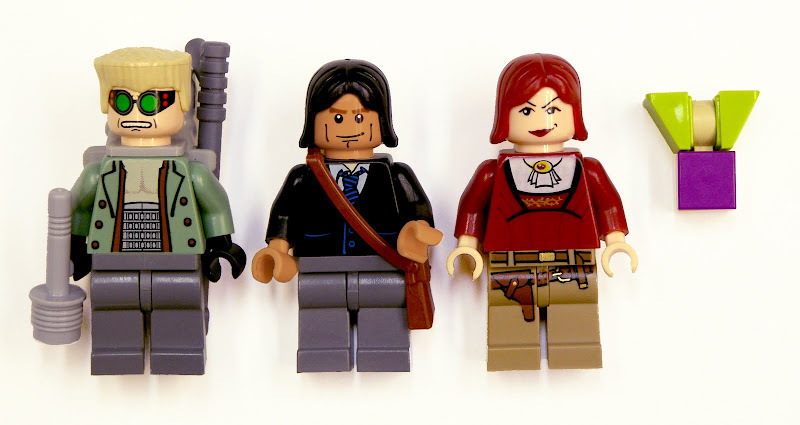 For example, Freddy's head and torso are from a Doc Ock minifig--Rapunzel's head is a reverse Catwoman. 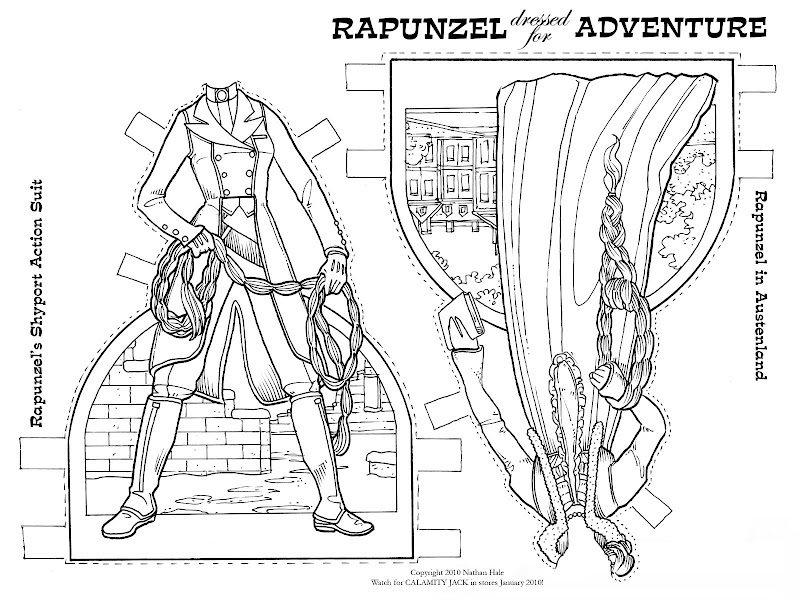 Jack's bag and Rapunzel's pants both belong to Indiana Jones. There is no LEGO bowler hat--so Jack had to go hatless. 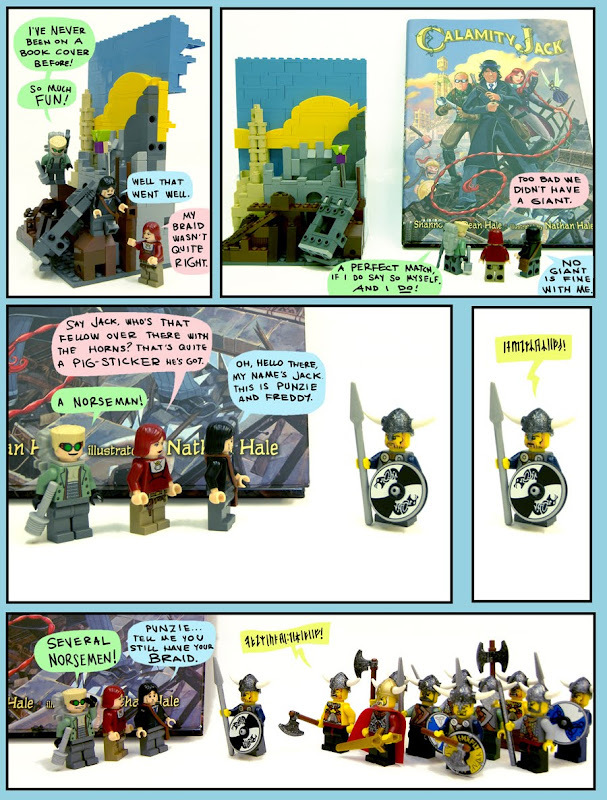 One day they'll figure out how to put a hat on top of LEGO hair (Playmobil does it, c'mon LEGO!) I did have to fudge the color on two items with Photoshop, can you guess what? 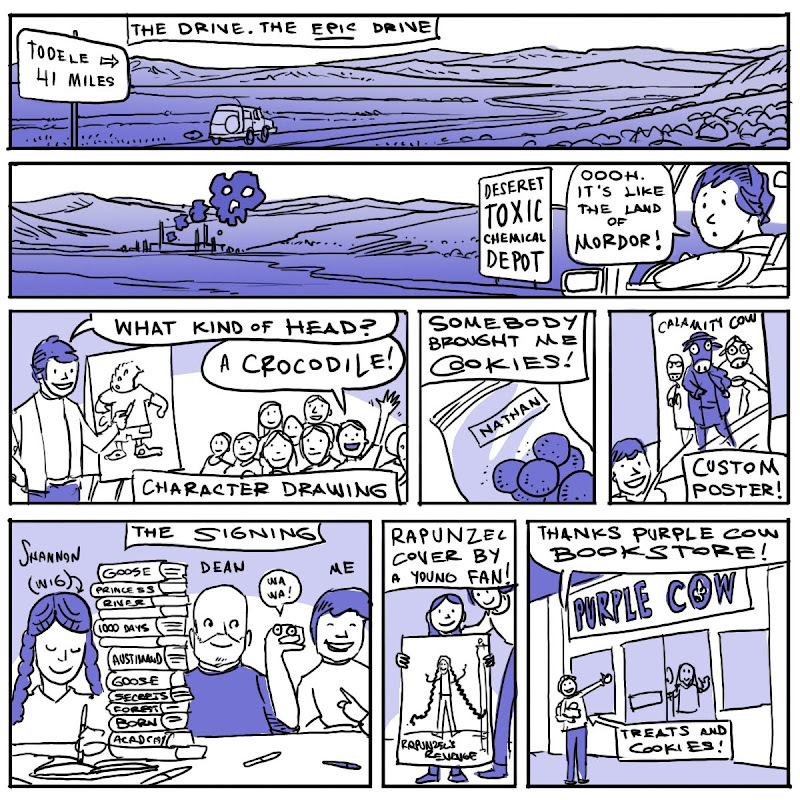 Hey everyone--everyone living in TOOELE, UTAH, that is: Calamity Jack signing event today! Al three Hales will be there, Me, Shannon and Dean! 2:00 at the Purple Cow Bookstore. See you there! If you are reading this from OUTSIDE of Utah, here's a contest. Spell for me the phonetic pronunciation of Tooele and win a prize! Holy smokes folks! I am smack in the middle of a perfect storm of deadlines! I have something in the area of 16 finished paintings due this week, for three different clients (all textbooks.) I survived Wednesday, hung on through Thursday, and have only the handful of Friday (today!) 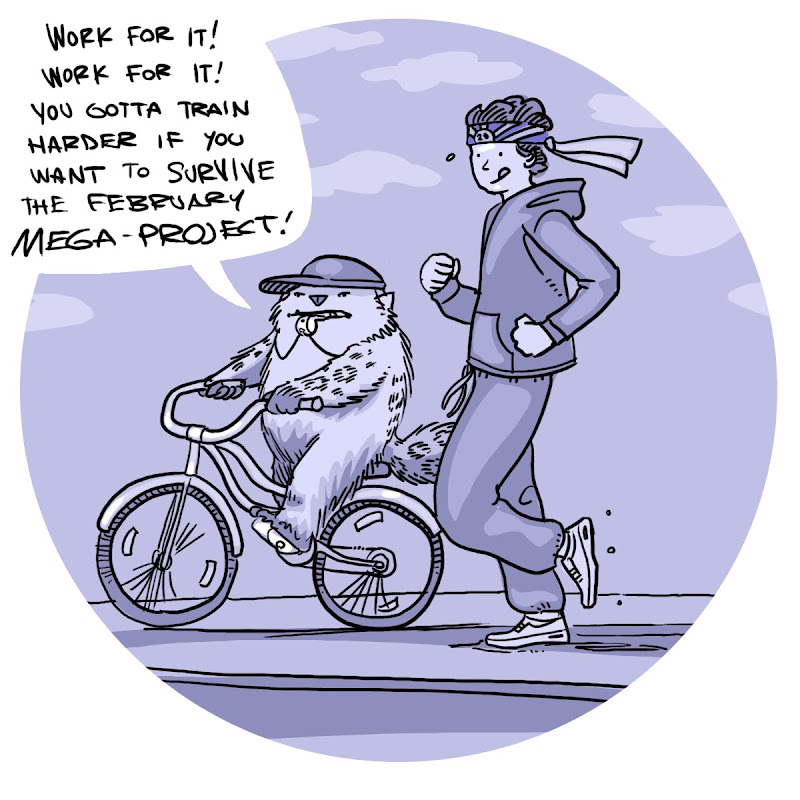 deadlines to survive! 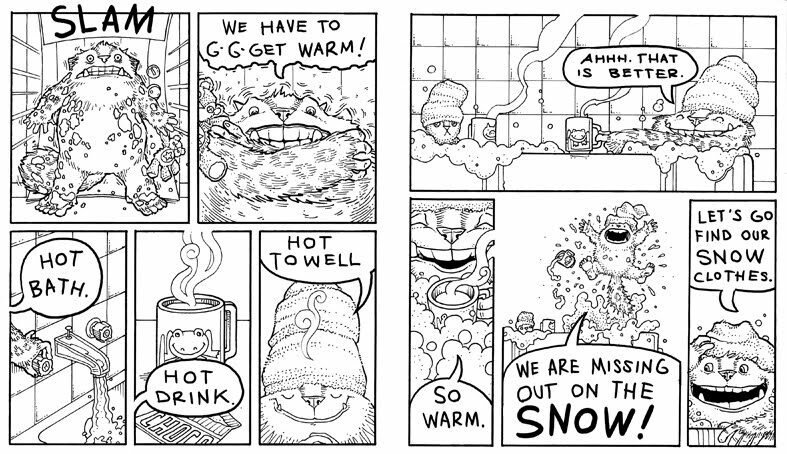 I'm not going to be able to letter and prep Yellowbelly's next snow page. 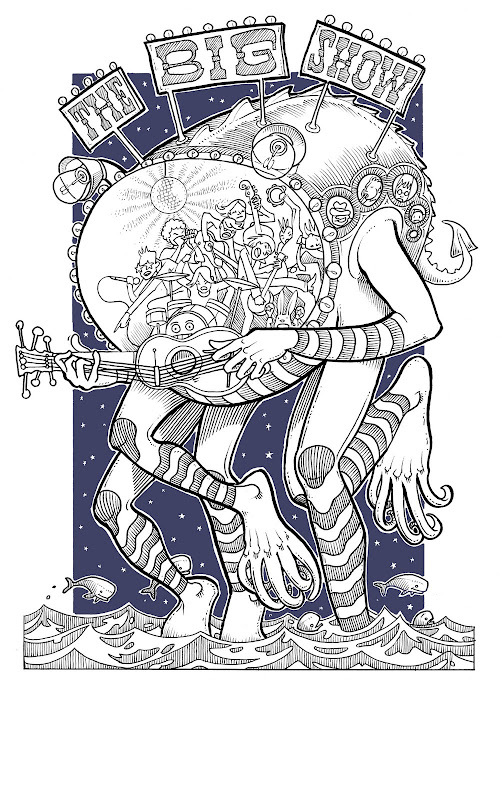 Instead, I'm dipping into the Totally Random Art File! This was for an event called THE BIG SHOW! Put on by my younger brother, Ben, who has more bands than I have book ideas. Random File Day! Enjoy! 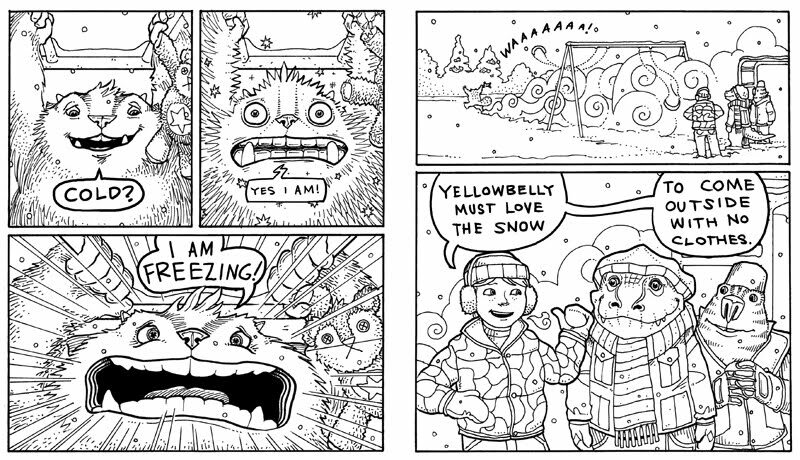 Yellowbelly will be back Monday. Sorry for the late post, gang. Computer troubles. Ya know. But at least YB and P warmed up. 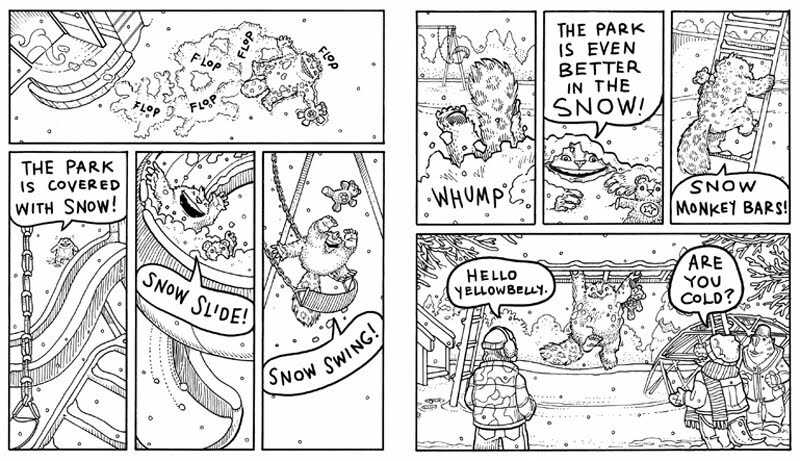 I'm trying to get Yellowbelly and Plum to make the jump from picture books to early reader books--that's why the language here is so simple. Let me know what you think. 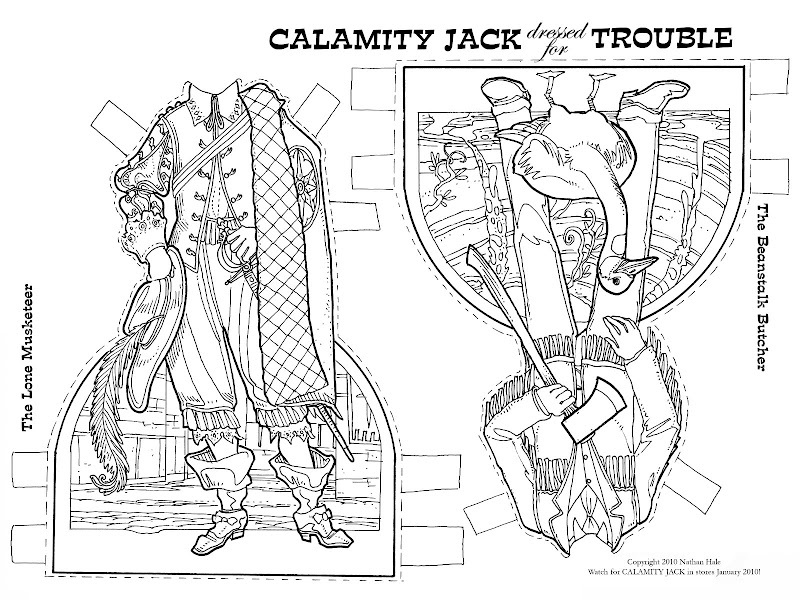 By the way--today's the final day to send in pics of your CALAMITY JACKs! 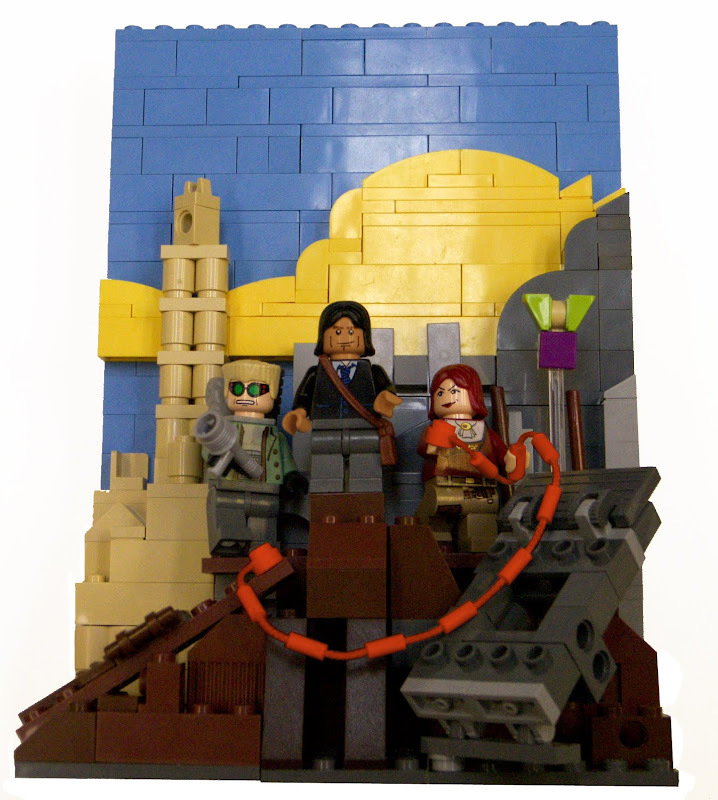 Tomorrow's the Last Day for Custom Avatar/Book Pics! 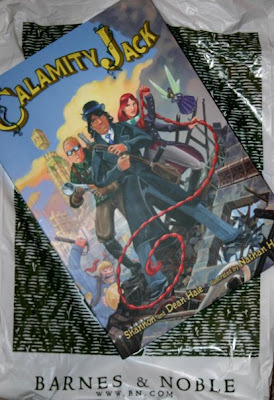 I just got a CALAMITY JACK book photo from Qatar! WOW! They have it in Qatar, but they don't have it at my hometown Barnes and Noble? Anyway, keep them coming! To everyone who's sent me a pic already, I'll be sending out an email response on Wednesday. Thanks again! 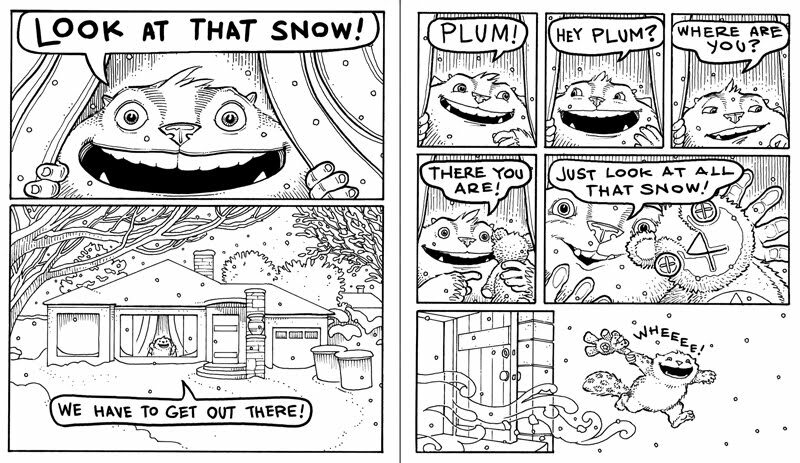 I announced earlier that I was starting a new comic this week, and here it is: Yellowbelly and Plum in the Snow. You may have to stretch your window wider to see it--it's a little wide. 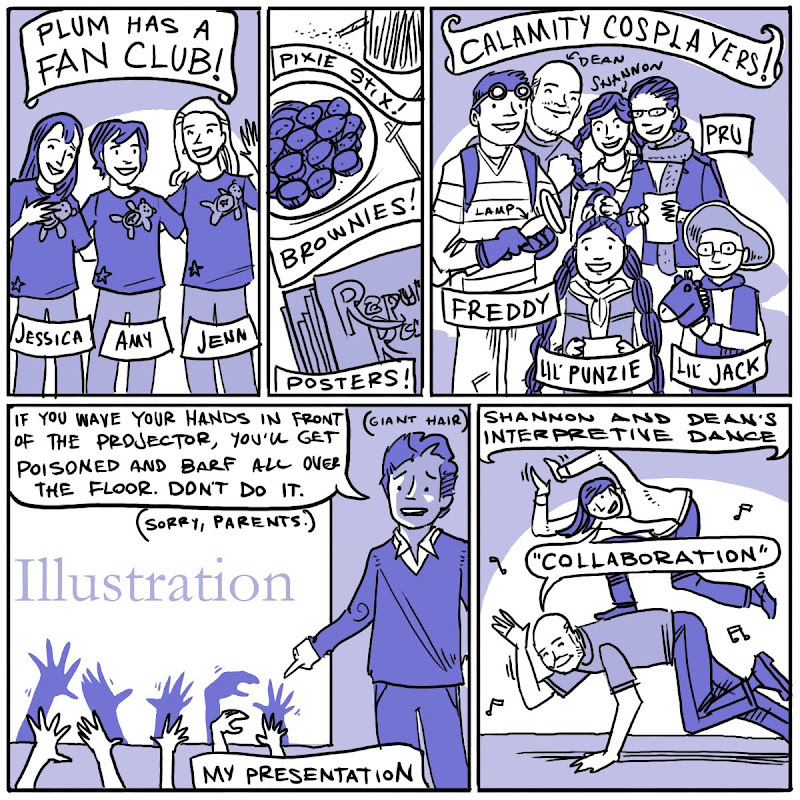 Remember we're having a CALAMITY JACK launch party tomorrow at the Foothill-Anderson Library in Salt Lake City (Saturday, January 9) at 2 pm. I hope to see you there! Here he is--the Jack Paper Doll, er, Paper Action Figure. What cool outfits will be available for him tomorrow? Sushi Chef? Dog Catcher? Fireman? You'll have to wait and see. I'm starting to get a bunch of launch week book photos. If you want your custom portrait, send in your photo before I come to my senses. If you've already sent one in, thanks, I'll get an email reply out to you soon, with portrait instructions. That's a CALAMITY JACK launch day purchase! Last month I said I'd do a custom blog banner for the first person to send me a photo of Jack in a retail setting. Which means Juliana is our winner! Congratulations Juliana! Be thinking of what you'd like, and we'll put it together. 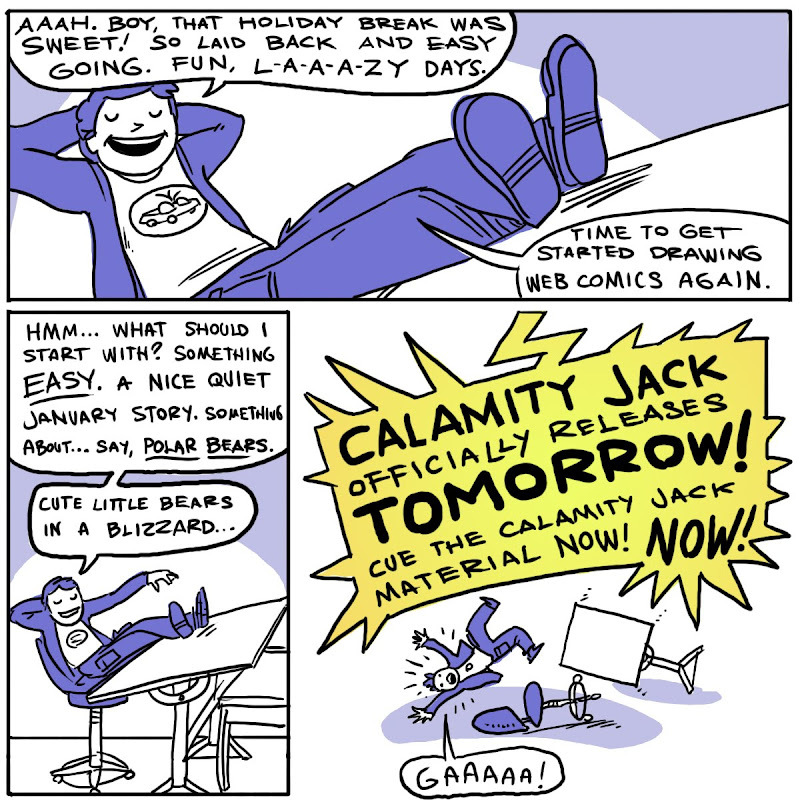 Here it is, CALAMITY JACK Launch Day! Pretty cool huh? I condensed these reviews and made sure to take any spoilers out. But very nice reviews all around! 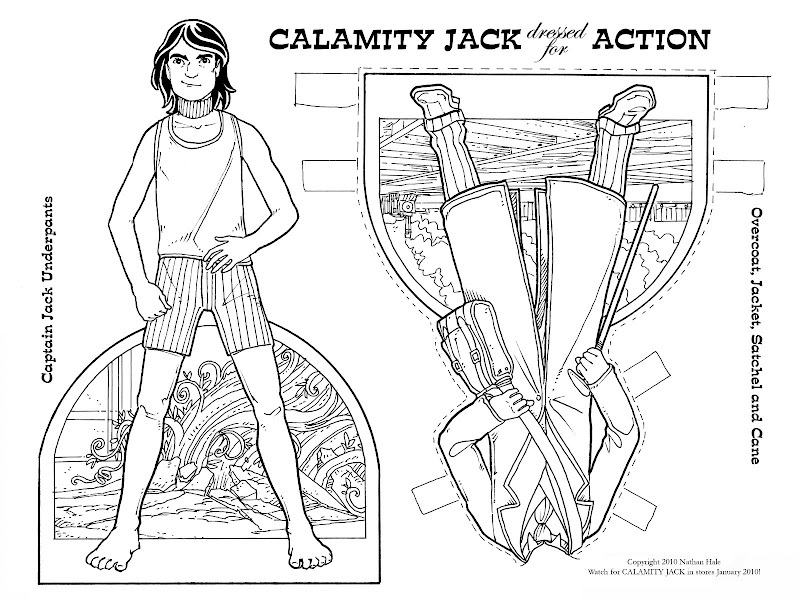 Happy CALAMITY JACK Launch Day!